Hair loss affects both men and women. It is usually caused by genetic factors. Anti-thinning shampoos promote hair growth and can help you attain a fuller head of hair. For the vast majority of people, hair loss is hereditary and a natural part of the aging process, but the good news is there are a number of options to help you attain fuller, more luscious hair. The first line of defense lies in topical growth treatments. There are a number of over-the-counter thickening shampoos available that are specifically designed to prevent hair loss and stimulate new hair through the use of amino acids, antioxidants and other compounds that help hair thrive. The average person loses between 50-100 hairs every single day, according to the American Academy of Dermatology. You probably don’t notice this shedding on a day-to-day basis because new hairs typically grow to replace the ones you’ve lost. Hair loss occurs when new hairs stop growing. As many as 42% of men aged 18-49 suffer moderate to extensive hair loss, according to figures published in Dermatologic Surgery. While hair loss is most commonly associated with men, studies show that 40% of women are affected by female pattern hair loss by the age of 50. What causes hair thinning in men? Genetics: Hair loss is most commonly caused by genetic factors, as well as hormone levels and the natural aging process. If male pattern baldness runs in your family, there’s a good chance that you too will experience hair loss. Medical conditions: There are a range of health issues and medical conditions that cause hair loss in men, such as psoriasis, ringworm and areata. There are also many prescription medications that can cause hair loss as a side effect. These include drugs used for cancer, arthritis, depression and more. Stress: You might experience hair loss if you go through a traumatic event. Hair loss usually begins about three months after the event. In this scenario, hair loss is usually temporary and your hair will start to regrow a few months later. Hairstyle: Certain hairstyles like pigtails and cornrows can pull your hair with significant force, and over time this traction can pull out individual strands of hair and even damage the follicles. What causes hair thinning in women? Pregnancy: The dramatic hormone fluctuations during pregnancy can affect the life cycle of your hair, resulting in more hair loss than usual. This condition, known as telogen effluvium, typically resolves itself in approximately six months. Menopause: During menopause, your body produces lower levels of estrogen and progesterone, two hormones that play a key role in your hair’s natural life cycle. Your body also starts to produce more androgens, which are a group of male hormones. Combined, these factors can lead to hair loss. Health conditions: Health conditions that are unique or more common among women such as anemia, thyroid disease and polycystic ovary syndrome can lead to thinning hair. Excessive hairstyling: Blow dryers, flat irons, and hair dye can put a significant amount of stress on your hair and potentially affect your hair’s growth cycle. Specifically designed for individuals going through the early stages of thinning hair. Although it can’t regrow hair that you lost a long time ago, Nioxin System 1 Cleanser Shampoo can help slow current hair loss by removing debris from your hair follicles and creating a healthy environment for new hair to grow. Adds volume to thin, damaged hair. Has a cool, minty smell that many users find refreshing. Can’t be used on dyed hair. Does not regrow lost hair. Contains sodium laureth sulfate, which may irritate sensitive skin. Made using a range of natural ingredients, including coconut oil, zinc and jojoba oil, which nourish the scalp and help keep hair follicles healthy. This product also claims to block DHT, an androgen believed to contribute to male and female pattern baldness. 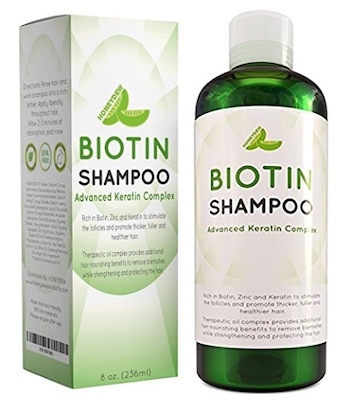 Best of all, Biotin Shampoo comes with a money-back guarantee. Promotes thicker, stronger, healthier hair. Does not contain any sulfates, parabens or other harmful ingredients. Can make your hair more tangled than usual. Some people don’t like the slightly medical smell. An especially popular product that’s been used by thousands of people to combat the signs of thinning hair. This product contains argan oil, a natural ingredient proven to repair and strengthen damaged hair. PURA D’OR Original Gold Label Anti-Thinning Shampoo is free of sulfates, making it a good option for people with sensitive skin. Has received thousands of positive reviews. Adds body, volume and luster to fine and thinning hair. Some people find that it makes their scalp dry. Contains no harsh chemicals and can be used safely on dyed hair. Lipogaine Hair Rejuvenating Shampoo incorporates a variety of natural ingredients, including biotin, argan oil, castor oil and saw palmetto to help add volume to thinning hair. Comes in a small 8 oz bottle. Contains a host of quality ingredients, including saw palmetto extract, which is scientifically proven to block DHT. Hairgenics Propidren was created to promote healthy hair growth and prevent hair dryness. It’s produced in FDA/GMP certified labs and comes with a 100% money-back guarantee. The most expensive option on this list. Redness and irritation around the scalp. Discontinue use if you notice any of these side effects and consider speaking to a dermatologist for professional advice. You can find expert dermatologists in your area using the Zwivel cosmetic doctor search tool. Thinning hair is most commonly caused by genetics, but it can also be the result of health conditions, medication, stress, and excessively styling your hair. There are a number of over-the-counter hair thickening shampoos on the market that are designed to reduce hair loss, promote new hair growth, and enhance the volume of your hair.